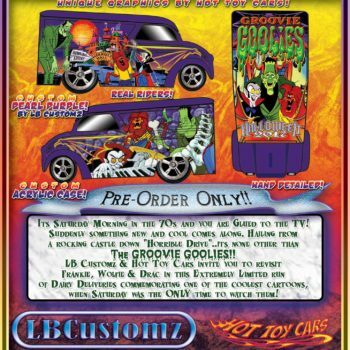 This is a LIMITED TIME, “PRE SALE” item. The time available to purchase is limited to ONLY 10 days!! 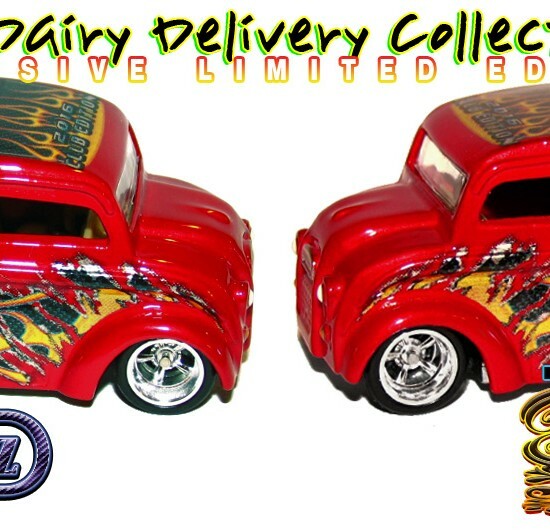 A classic team up of world renown professional customizers brings you this “rippin’ EXCLUSIVE Dairy Delivery Limited Edition!! 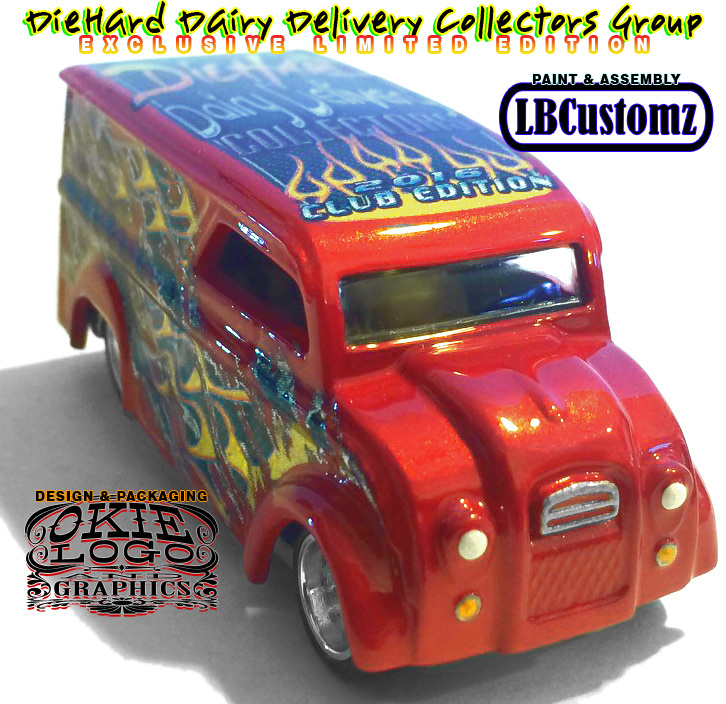 Features a brand new design from Okie Logo (KB Kustoms official design company) and the masterful paint and assembly of LB Customs (Dino Laspada) who are both members of the Diecast Hall Of Fame btw!! 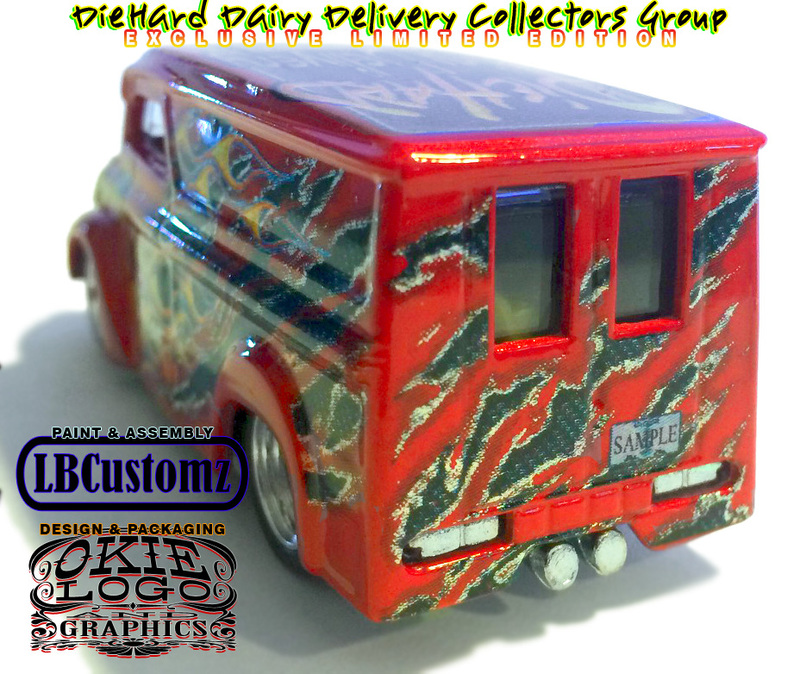 After designing a new Header image for their facebook group page, Dino and KB were asked about doing a Club Car for Diehard Dairy Delivery Collectors. We came up with this exclusive beauty! 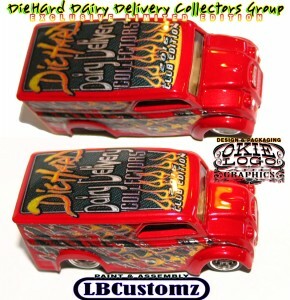 Elements from the Facebook Header design were also used on the actual club car dairy, but this is a unique design only found on this exclusive edition. Dino suggested this stunning Raspberry Red Pearl base color, which couldn’t be hotter! The ripped paint effect shows a carbon fiber underbase, with killer yellow/orange flames appearing to emanate from underneath the rips. They intertwine over and under the rips too. The rips themselves were painstakingly detailed with scrapes and shadows for a realistic look. 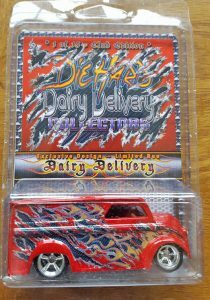 And making it even cooler…special, hard to find metallic inks were used for the graphics which really gives the rip edges a visual “POP”!! The carbon fiber look is also utilized for the roof design, however is not “ripped” as are the sides. It appears as a panel, with chrome trim edges. The club lettering designs are allowed to extend out of the edges, so they appear to be floating “over” the carbon fiber roof panel. Some nice yellow/orange flames emerge from the front of roof panel, and the 2016 Club Edition is emblazoned over them. Top notch work guys…… Maybe next year we can do an anniversary edition!!! This is an awesome collaboration peice between Kevan and Dino. I have bought from Dino in the past. After receiving this peice and seeing what Kevan is capable off, i can certainly say i will be looking to buy from these two legends again in the not so distant future. A stunning piece by two great guys!!! This this is awesome. Very happy to have in my collection. Thanks again Kevan and Dino! !